How do you type some special characters, signs, symbols, accented letters and other Unicode languages in Windows operating system such as Windows 10, Windows 8.1, Windows 8, Windows 7 and Windows Vista? These characters include some regular used symbols and signs such as © (copyright), ® (registered), ± (plus-minus), ™ (trademark), Ω (ohm), √ (square root), ∞ (infinity), ‼ (double exclamation mark), → (various arrows), ¿ (inverted question mark), ° (degree), µ (micro), ≈ (almost equal to), ≠ (not equal to), ☺ (smilies face), ₠ (Euro currency), € (Euro), £ (English Pound), ¥ (Japanese Yen), ¢ (cent), ² (superscript), ½ (fraction), ≤≥ (greater or small than or equal to), ℅ (care of), «» (double angle quotation mark), œ (Latin capital and small letter), β (Greek capital and small letter), Ѿ (Cyrillic capital and small letter), ك (Arabic letters), א (Hebrew letters) and etc. You won’t find these characters on your keyboard. In Microsoft Office programs such as Word and Excel, you can use Insert Symbol function to put these special characters into your documents or spreadsheets. However, what if you want to use and type these non-standard characters in other application such as Notepad or on your blog? If you know the ALT key numeric codes for the corresponding character (such as ALT-0128 for €), you can hold down the ALT key, and then press the numbers sequence using the numeric keypad (number keys on main characters keyboard won’t work). You possibly won’t remember so many of them though, so there are easier method to type all these special characters and accents. Windows comes with a Character Map program. To run Character Map, click on Start menu, then select All Programs → Accessories → System Tools (in Windows Vista and Windows 7) or All Programs → Windows Accessories (in Windows 8, Windows 8.1 and Windows 10), and you will see Character Map. Alternatively, type charmap in the Start Search text box and hit Enter. 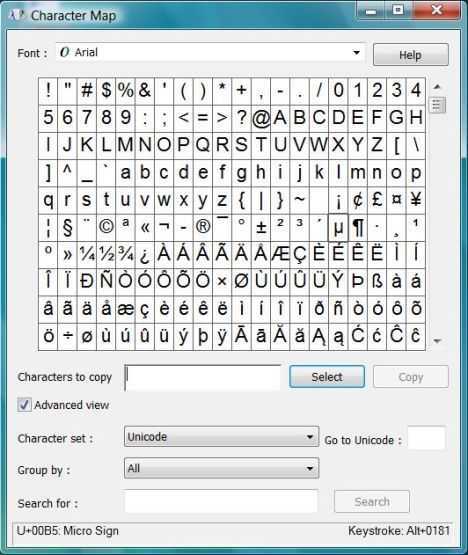 In the Character Map application window, find and locate the symbol or letter that you want to insert to your text, double click on it (or press Select after clicking on the symbol), and character will automatically copied to clipboard, which users can paste (or CTRL-V) to the document. To append another character, simply double click on new character again, and the whole string, as seen in “Characters to copy” text box will be memorized on clipboard. If you do any modification on the characters in the text box, remember to click Copy button to refresh the clipboard. Note that different font may have different kind of character map, so do choose the font which you’re using.